Del Norte Local Transportation Commission has been advocating for improvements on US Highway 101 at Last Chance Grade since its inception in 1982. The documents posted on the Caltrans' project website tracks the State's more recent efforts and their conclusions leading to the situation we have today, which is essentially the same as 24 years ago when DNLTC was formed. A look to the past can provide a sense of scope and framework, and a focus on the future may one day resolve the issues. I encourage project advocates to be informed and the information on the Caltrans District 1 page is factual and informative, and I encourage advocates to contact DNLTC with questions or concerns by mail, email or phone. If you would like to be added to my list of recipients for project updates, please send me an email. 2006 Joint Resolution including Del Norte County Board of Supervisors, City of Crescent City, Crescent City Harbor District, Del Norte County Unified School District, Tri-Agency Economic Development Authority, Crescent City/Del Norte County Chamber of Commerce. 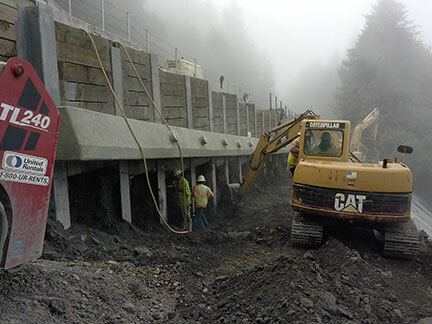 Eureka – Last Chance Grade south of Crescent City on Route 101 in Del Norte County has experienced one way traffic control this construction season due to a current project to strengthen and repair a retaining wall. 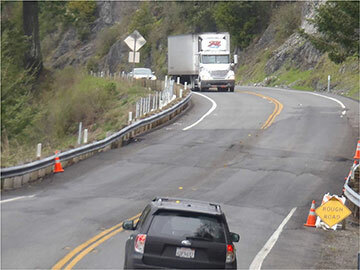 The area is active geologically as a slide area, and Caltrans recognizes how vital this segment of highway is as a connection to the rest of California for residents of Del Norte County. Caltrans has a long history of keeping this segment of the highway open and maintained. Below is an update on the current project, and an announcement that will be good news to those looking to the future of this segment of highway. A Caltrans engineered feasibility study for Last Chance Grade is currently underway. The study is a detailed investigation that considers a full range of needs, options, ideas, opportunities, and constraints. “We are excited to have an opportunity to take a closer look at this section of Route 101,” said Brad Mettam, District 1 Deputy District Director for Planning and Local Assistance. “We look forward to receiving public input and ideas as the study progresses. The Last Chance Grade corridor area has over 200 active slides according to a geological study from 2000. We are looking to discover creative solutions for this portion of highway.” Once completed, the engineered feasibility study will be used as a reference document identifying potential improvement projects, enabling Caltrans to respond to and compete for various project funding sources as they become available.